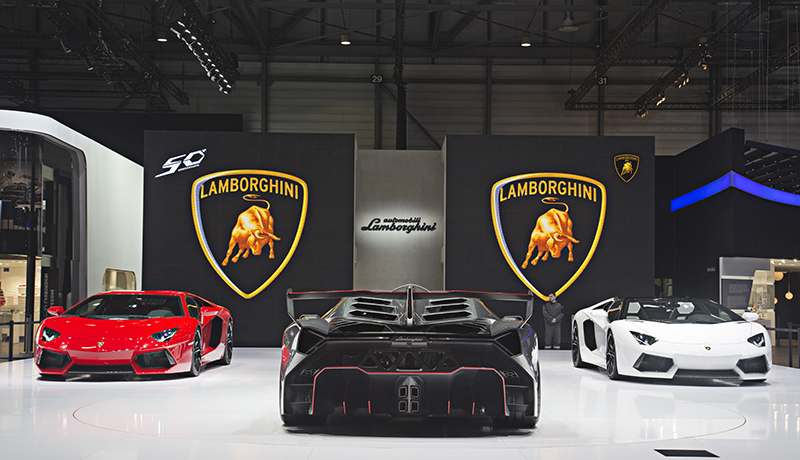 Celebrating the year the automotive world changed. The story begins over 50 years ago when one of the successful agricultural equipment manufacturers in Italy was told “you may be able to drive a tractor but you will never be able to handle a Ferrari properly,” by Enzo Ferrari. 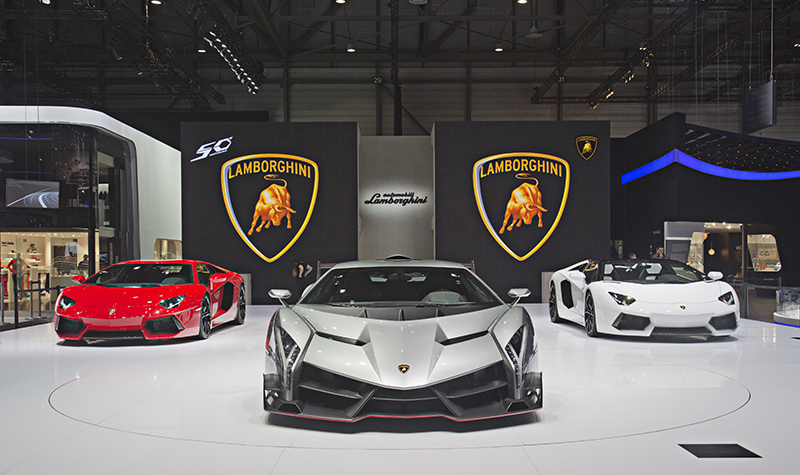 That man was Ferruccio Lamborghini, and that comment led him to create Automobili Ferruccio Lamborghini S.p.A. in 1963 and produce some of the greatest sports cars to-date. Prior to Ferrari’s remark to Lamborghini that led the man to create one of the most well-known super car brands in the world, there was a legendary fighting bull in Spain that was one of the strongest and most aggressive to ever compete, even going as far as to fatally wound the famous torero, José Sánchez Rodríguez. 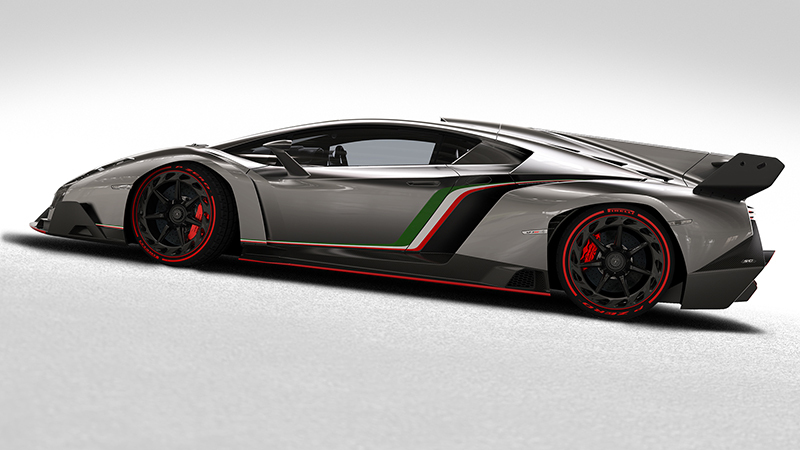 Its name was Veneno and its triumphs in the early 1900s still continue to live on today. 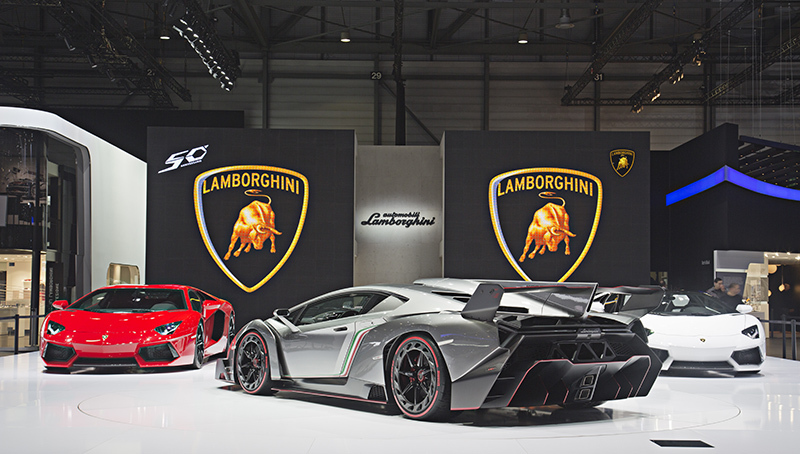 In 2013, the two iconic names met to celebrate the 50th Anniversary of Automobili Ferruccio Lamborghini S.p.A. with the new Lamborghini Veneno super car that is nothing short of a feat of engineering. 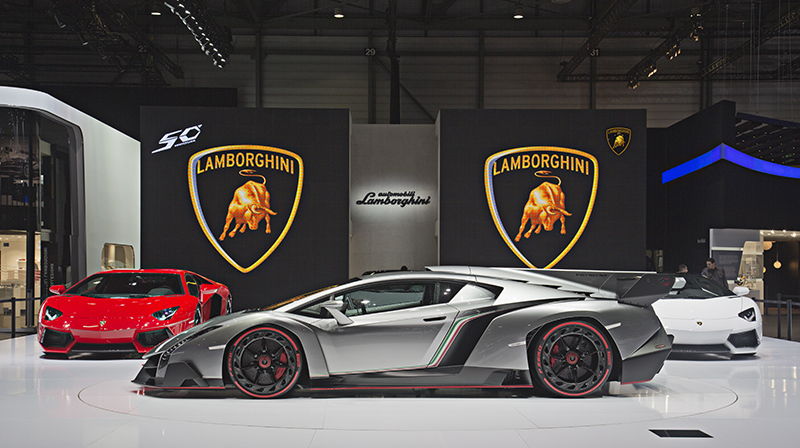 Only four examples of the new Veneno have been produced, with number “0” being kept by the automaker. Production model “0” will wear all three colors of the Italian flag, while the other three production models that have already been sold will wear a single color from the flag, all combining to create the red, green, and white national flag when together. 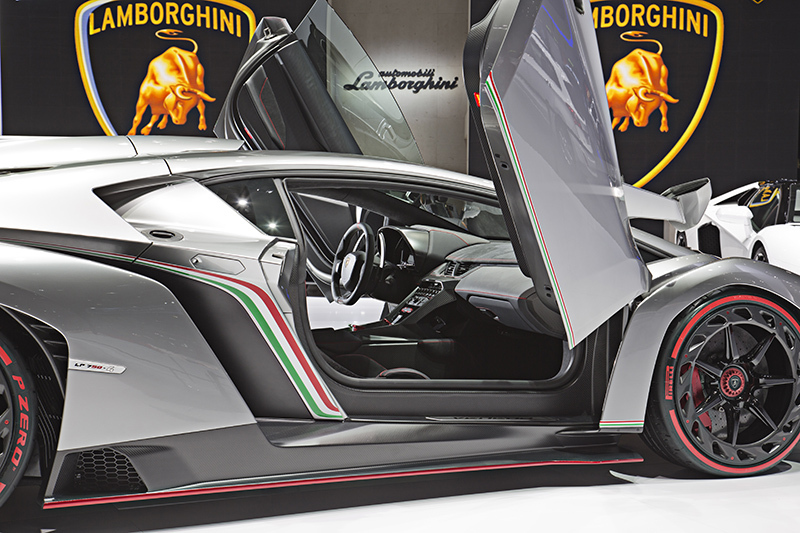 The new Lamborghini Veneno is essentially a prototype race car that’s built for the street. Virtually every aspect of the car is designed for performance from the carbon fiber construction to the aerodynamically-optimized body work that creates a massive amount of downforce. 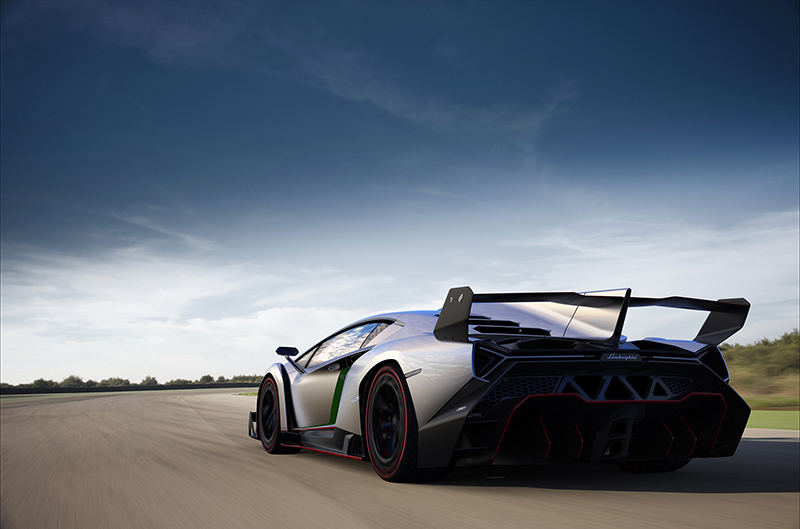 The entire design of the Lamborghini Veneno was made to bring the aerodynamic efficiency and downforce of a race car to the road to provide drivers with the ultimate in driving dynamics. The sleek arrow-shaped profile begins at the front bumper that works as an aerodynamic wing to redirect air to the hood, windshield, and front wheels for better cooling. A pair of slim Y-shaped LED headlights run rearward into the front fenders that are separate from the body; a design similar to that of prototype race cars to help optimize aerodynamics. Air flows around the front fenders, exits the wheel wells, and goes straight into the massive rear air intakes integrated into the rear fenders to provide the 6.5-liter V-12 with cool intake air. Atop the Veneno is a slim intake that serves to cool the engine and flows into a special “shark” fin that prevents the car from flipping over in the event the driver loses control and slides sideways on the race track. The fin runs across six wedge-shaped openings that cover the engine and help to dissipate heat more efficiently. The rear is dominated by a large adjustable wing that works along with a smooth underbody that transitions into a large carbon fiber diffuser to create a tremendous amount of downforce. 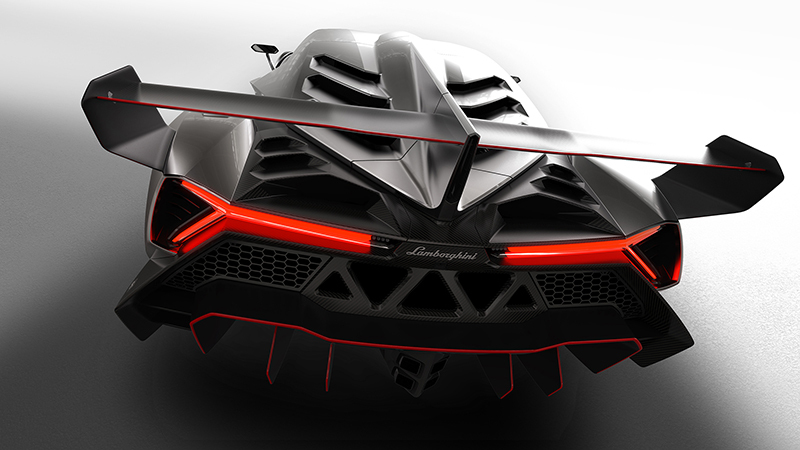 Slim Y-shaped brake lights, indicator lights, and fog lights are worn by the rear of the Veneno and complement the design of the front headlights. 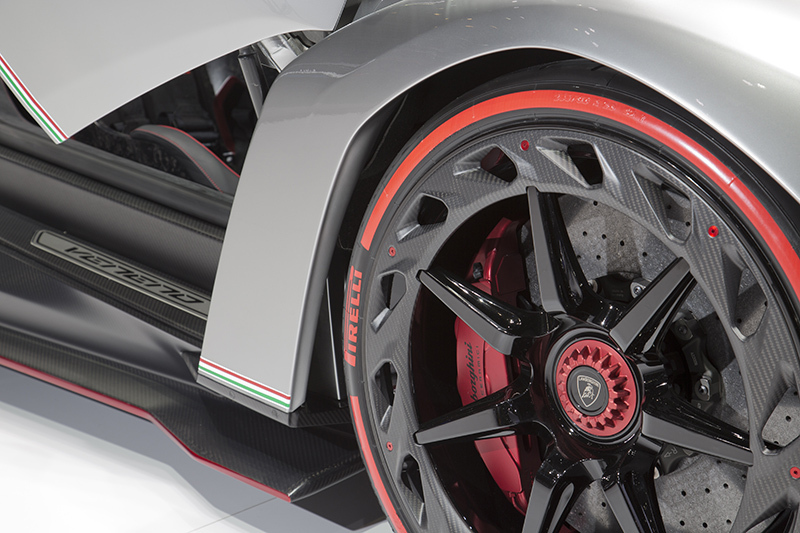 Even the wheels feature an aerodynamic design and are clad in carbon fiber. The center-locking 20-inch front and 21-inch rear alloy wheels wear a carbon fiber ring that acts as a turbine to send cool air into the carbon ceramic brakes for better stopping performance. 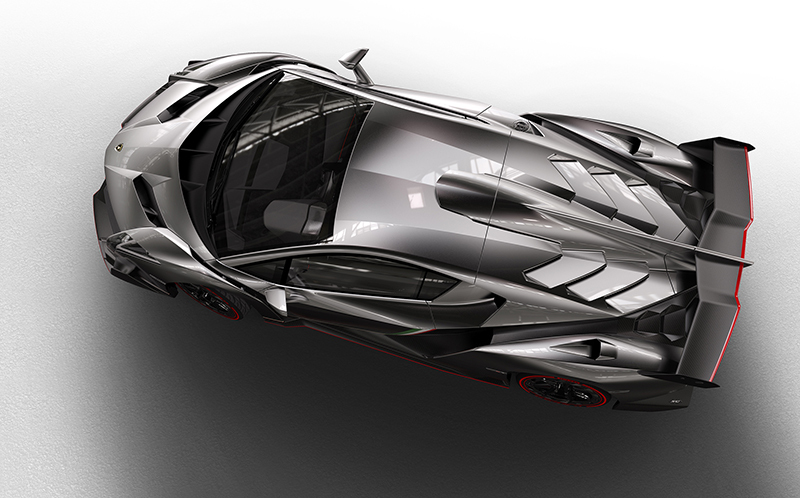 The entire Lamborghini Veneno is covered in an exclusive grey-metallic look color with specific parts left to shine in all of their carbon fiber glory. Each of the three customer cars will feature a red, white, or green accent while the production number “0” model wearing the colors of the Italian flag in a stripe across both sides. Beneath the aerodynamically-optimized carbon fiber exterior skin sits a 6.5-liter V-12 engine that’s been overhauled to create a massive amount of power. Lamborghini engineers upgraded the naturally aspirated engine with larger intake paths, optimized thermodynamics, a lightweight exhaust with low backpressure, and a higher maximum engine speed to result in an incredible750 horsepower output. 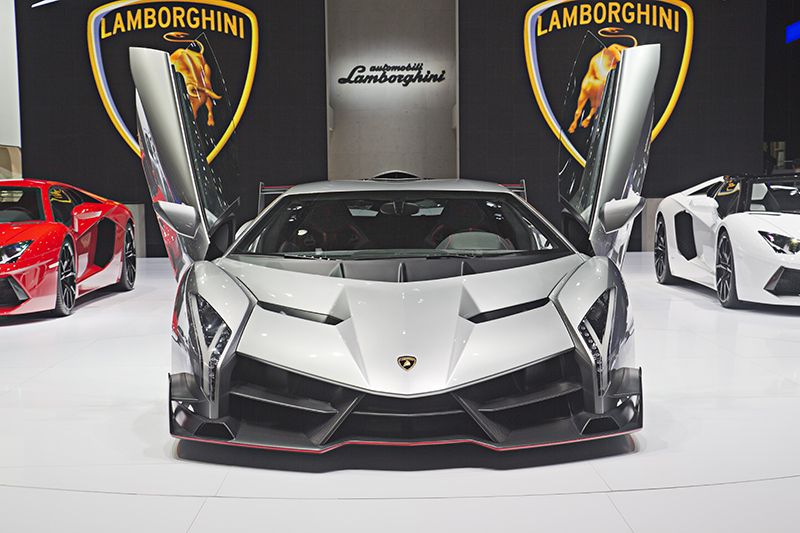 This, paired with the five-mode, seven-speed ISR transmission and permanent all-wheel drive system allows the Lamborghini Veneno to accelerate to 62 mph in only 2.8 seconds and reach a top speed of 355 km/h (221 mph). 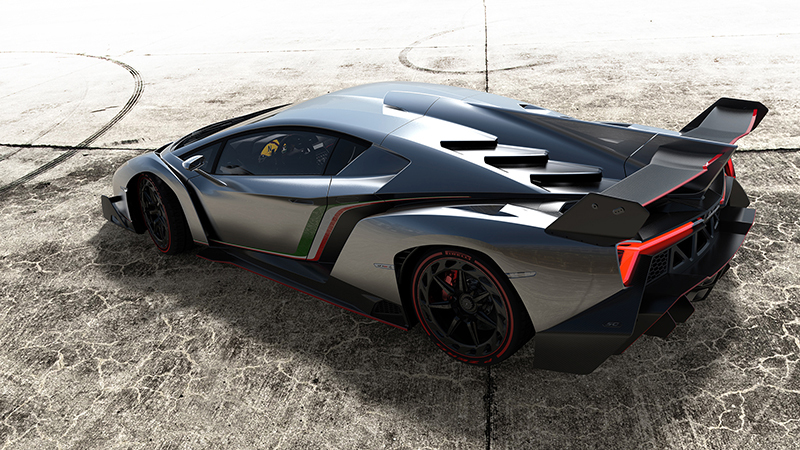 Even though the Veneno is based on the Lamborghini Aventador, the new super car is 275 lbs. 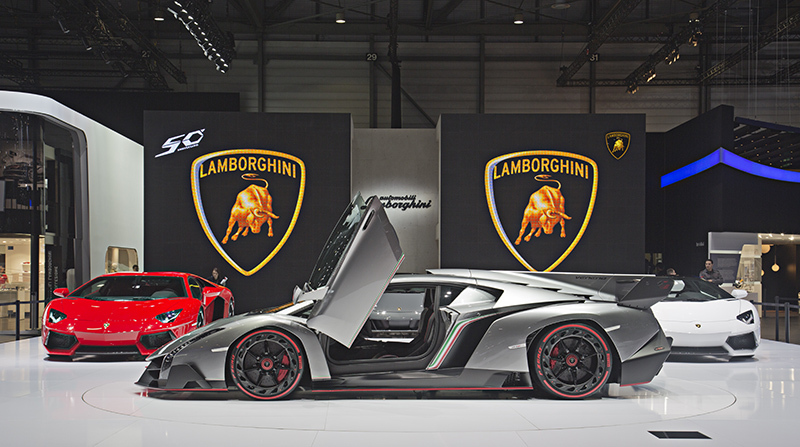 (125 kg) lighter than its Aventador sibling. This lower weight comes as the result of Lamborghini’s generous use of innovative carbon fiber technology throughout the car. Carbon fiber reinforced polymer creates the monocoque and is connected to aluminum alloy front and rear sub frames, along with every single exterior component. 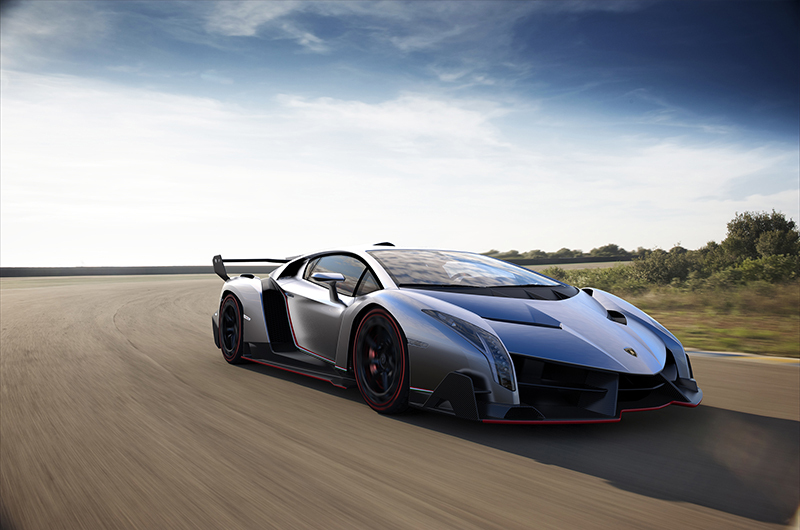 A pushrod suspension with horizontal spring and damper units gives the Veneno sharp and precise handling dynamics that make navigating high-speed turns enjoyable and exciting. Even the interior is designed around a lightweight, minimalistic design with a modern form. The CFRP monocoque shines through the central tunnel and sills while a pair of lightweight Forged Composite bucket seats wrapped in CarbonSkin woven carbon fiber that is soft, flexible, and comfortable, and also weighs less than traditional fabric. The CarbonSkin is also worn on the headliner and other parts of the cockpit. Facing the driver is an instrument panel that was entirely redesigned to showcase aggressive graphics and features new information displays such as the G-meter. All of these carbon fiber and advanced lightweight materials add up to a feathery 3,190 lbs. (1,450 kg).. 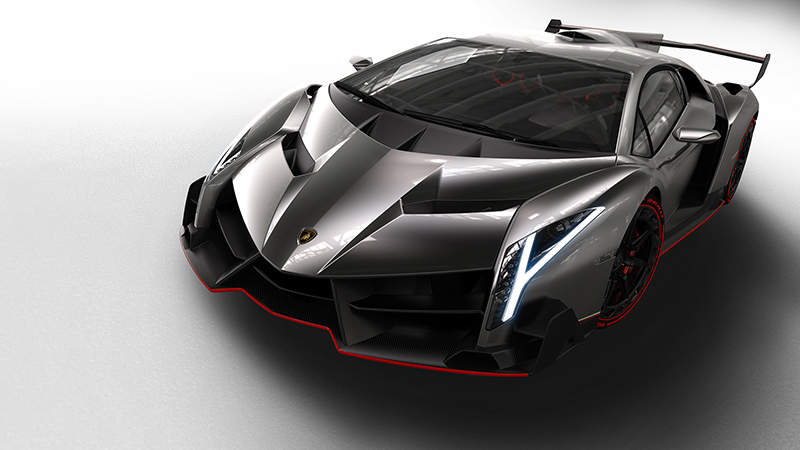 This also gives the Lamborghini Veneno an impressive power-to-weight ratio of just 4.25 lbs./hp (1.93 kg/hp), for otherworldly acceleration and handling performance. 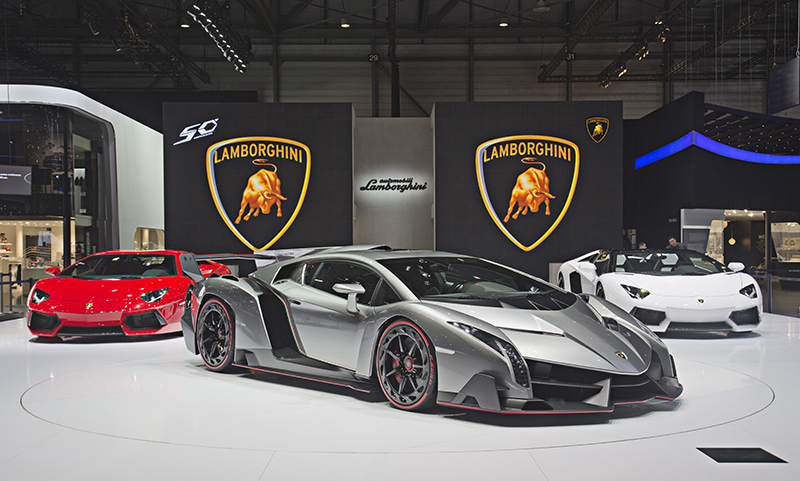 Only three of the Lamborghini Veneno models were ever made available to the public at the price of 3 million Euros, which is about 3.9 million USD, and each one has already been sold and will be produced throughout 2013. The lone model number “0” will be kept by Automobili Ferruccio Lamborghini S.p.A. and not be made available to the public. 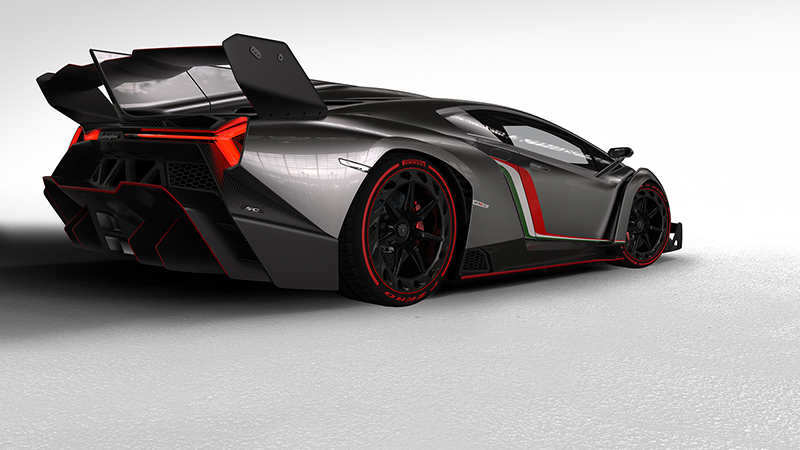 What is your favorite part of the new Lamborghini Veneno? Leave a comment and let us know!